(1) Projected growth in the use of distributed solar photovoltaic power in Brazil in the upcoming years: According to data from ABSOLAR and projections of the Brazilian Electricity Regulatory Agency (Aneel), the micro-and mini-solar photovoltaic distributed generation installed capacity in residences, businesses, factories, rural producers and public buildings will increase from 182.6 MW in 2017 to 3.2 GW in 2024. In addition, estimates made by Bloomberg New Energy Finance (BNEF) indicate that, in 2040, distributed solar photovoltaic power will account for 20% of the country’s electricity supply. (2) The country’s commitment to increasing the use of non-hydropower renewable energies: Through its Nationally Determined Contributions (NDCs), Brazil has set as a goal that, by 2030, 45% of the Brazilian energy matrix will be composed of renewable energies and that the share of non-hydropower renewable energies in the supply of electricity will increase to at least 23%. (3) Few financial products aimed at financing distributed solar photovoltaic generation power: The market perception (later corroborated by the survey of financial products carried out in this study – Appendix I) shows that there is a low volume of resources and a limited number of financial products dedicated to the financing of solar photovoltaic power projects, which may compromise the attainment of the Brazilian NDCs. 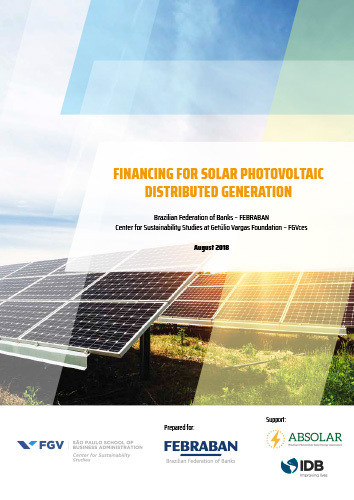 • To discuss proposals to enable the scalability of financing distributed solar photovoltaic power projects in the following segments: individual, cooperatives and Legal Entity (small and medium-sized enterprises).